At the end of July, we are encouraged to see the positive experience over the first six months of the year continue. Below is a summary of specific hotel performance (a key barometer) for July and now “year to date” January through July. July was another solid month with Hotel Occupancy just north of 85%. This is an encouraging result for the continued growth and momentum in Hotel Demand, which was up 3.3% for the month. Rooms Supply growth continues to be a drag on occupancy as it also increased, by 2.8%. A key ingredient in the month was the really encouraging growth in Group Hotel Demand – up 17.8% - as July simply was an outstanding month of hosting previously won meetings and conventions (and another vivid example of the importance of summer meetings and a key output of Choose Chicago). Leisure Hotel Demand was again high (representing 68.7% of all hotel rooms consumed). The strength and volume of growth on the group side obviously displaces some opportunities for growth on the leisure side. Year-to-Date, Hotel Demand is still pacing quite strong at a 5.5% increase for the year, outpacing the 3.7% increase in Hotel Supply. The well-documented increase in supply does continue to have a drag on hotel occupancy – up only 1.7% year to date. August and September are key months as we host some of our most impactful meetings and conventions of the year and look forward to the momentum continuing in the short term. As always, thank you for your support of and cooperation with Choose Chicago and on behalf of our Visitor and Meetings Industry. 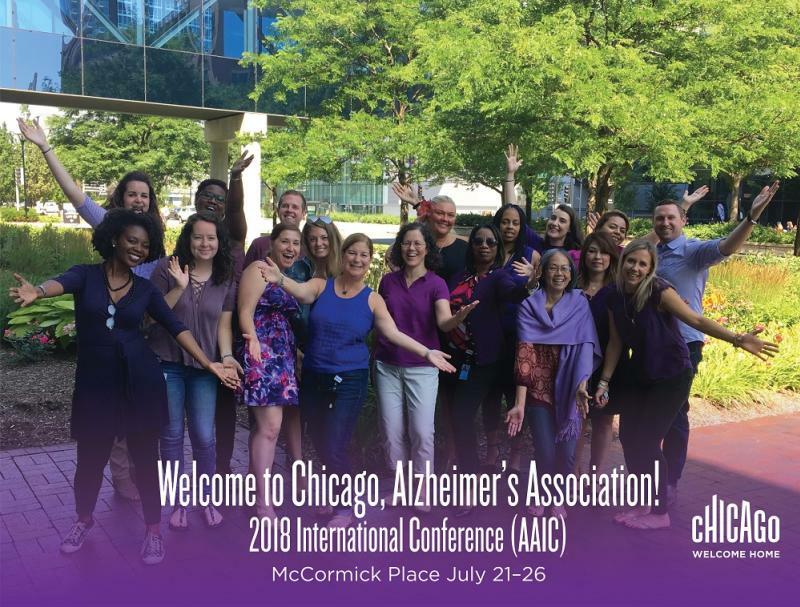 Choose Chicago staffers welcomed the Alzheimer’s Association’s International Conference to McCormick Place last month (July 21-26). Choose Chicago staff, L-R: Roz Stuttley, Julianne Touhy, Brigid Sullivan, Jewel Spencer, Yvette Jaskiewicz, Kevin Navitskas, Anastasia Straley, Rose Horcher, Cindy Payne, Tamara Jones, Lisa Dixon, Erica Smith, Lyndell Fong-Jones, Morgan Tomaso, Josie Moreno, Marivel Rodriguez, Sara Turkowski, Matt Podor. The world’s leading basic science and clinical researchers, next generation investigators and clinicians from more than 70 countries convened in Chicago last month for the Alzheimer’s Association’s 2018 International Conference (AAIC). Each year, AAIC attendees share research discoveries that will lead to methods of prevention and treatment, and improvements in diagnosis for Alzheimer’s disease. In honor of the Association’s annual meeting, the Building Owners Management Association worked with Choose Chicago to turn the Chicago skyline purple. Purple is the official color of the Alzheimer’s movement. Choose Chicago’s Client Services (CS) Team serves as the main liaison between booked convention business and the City. The CS team begins working with clients 12 - 24 months in advance, coordinating and facilitating hotel and venue site visits, promo trips, and more. IMTS is right around the corner! The Choose Chicago Client Services team escorted the IMTS Show Managers around Chicago to film promotional videos for IMTS 2018. Check them out! 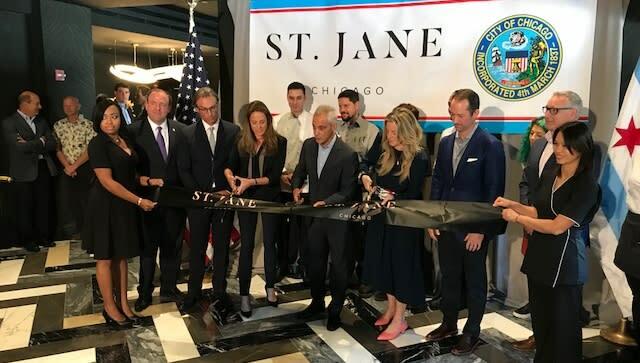 Chicago Mayor Rahm Emanuel, joins Aparium Hotel Group’s Kevin Robinson and Mario Tricoci, Jill Mast and Carrie Meghie of Becker Ventures, Jordan Engerman, Choose Chicago’s Director of Partnerships and others in a special ribbon-cutting ceremony signaling the opening of the newly refurbished and renamed St. Jane Hotel, formerly known as the Hard Rock. The ribbon cutting took place on Tuesday, July 24, 2018. Choose Chicago recently visited the Field Museum of Natural History in preparation for a special partner profile video for an upcoming issue of The Destination. The museum is celebrating its 125th anniversary. 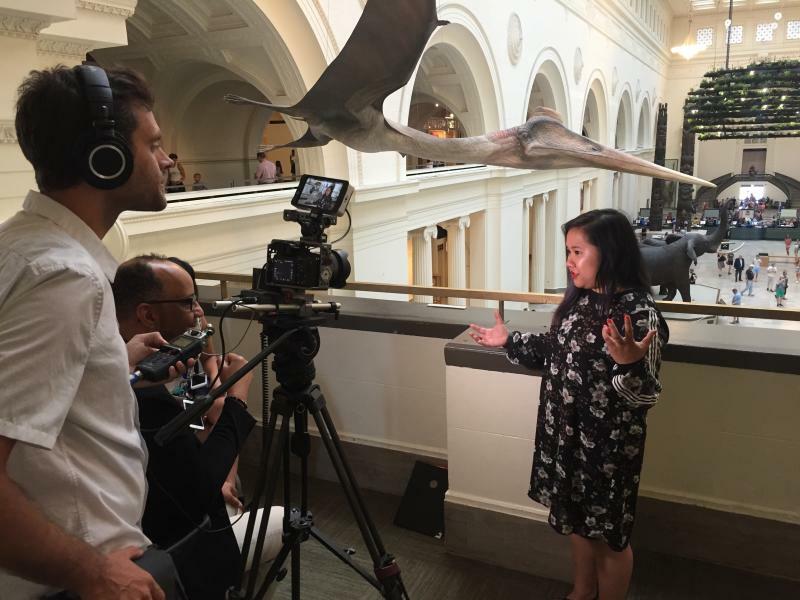 Angelica Lasala, Field Museum Public Relations coordinator, shared some museum insights with the Choose Chicago team. Join up to 600 industry professionals and meet directly with corporate activity providers, meeting and event venues, corporate entertainment and event service providers. It’s never too early to find ideas for your holiday parties and future events. Admission includes food, drink, beer and liquor samplings, networking, giveaways and entertainment. On FOX32, L-R: FOX32 news anchor Sylvia Perez, Choose Chicago Cultural Tourism Director Jason Lesniewicz, Dave Dahl, Lo Rez Brewing, Pilsen and Danielle D&apos;Alessandro, Executive Director of the Illinois Craft Brewers Guild. 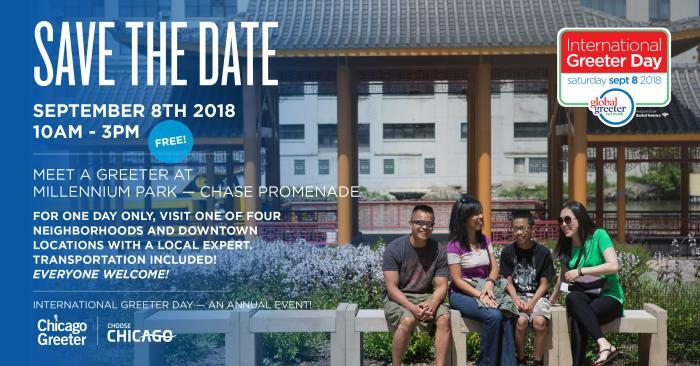 Choose Chicago and the Illinois Craft Brewers Guild recently joined Fox32 midday news anchor Sylvia Perez for an on-air celebration Chicago Friday Night Flights’ summer series returning for a second season. Produced by the Illinois Craft Brewers Guild and Choose Chicago, the festivals, held from June to August, showcase neighborhood breweries and celebrate Chicago’s craft beer scene, which has made Chicago a leader among U.S. cities. Chicago’s neighborhoods are home to more than 60 breweries featuring some of the nation’s best award-winning beers, creating a diverse array of styles. The July Friday Nights Flights event at 31st Street Beach was rescheduled to August 24. Visit chicagofridaynightflights.com for locations, dates, and sampling passes. Canada: Choose Chicago’s Global Development team traveled to Vancouver from June 25-28, with the Godfrey Hotel Chicago, to conduct Sales Calls. With over 50 agents trained and 14 appointments held, the agency trainings and one-on-one appointments provided a Chicago destination update and helped engage Choose Chicago partners with the Canadian Market. The Global Development team contributed a welcome gift and Chicago Official Visitors Guides for the first flight from Calgary in support of American Airlines new flight launch to O&apos;Hare International Airport. At the gate, they had Chicago-style hot dogs to get flyers excited on Chicago as a destination. China: On June 14th, the team hosted in-house trainings & Travel Trade updates, using Chicago travel resources, to educate Chongqing Travel Trade during our Sales Mission. Partners in participation included: Chongqing Grand China Express, Chongqing Golden Holiday, & Chongqing CYTS. From June 20-21, we met with eight key decision-makers from Shanghai Travel Trade to provide an update on Chicago tour information and resources to develop new tour packages. Finland: Atlantic Link CEO, Karin Gert Nielson, represented Choose Chicago at Discover America Finland in Helsinki. The Workshop and event focused on presentations, competitions, and networking. Apart from a Chicago presentation at the event, Karin also had the opportunity to inform the 100 Travel Trade agents about news from Chicago, flight routes, and lesser-known facts about Chicago. Germany: To coincide with an in-depth travel feature on Illinois in the highly regarded magazine America Journal targeted to the German market, Choose Chicago advertised the destination in language on one full page. Italy: Choose Chicago partnered with Visit USA in Italy, to host a Webinar for Italian Travel Trade on May 8th. We also collaborated with Konrad travel to highlight their Chicago to San Francisco Amtrak Zephyr route. The purpose of this webinar was to train the registered Product Managers and Travel Agents on Chicago’s available tourism product. This webinar resulted in 178 Italian Travel Trade Professionals educated on Chicago as a leisure destination. The Global Development team and 17 Choose Chicago partners welcomed seven Italian Travel Trade Professionals (Eden, Press Tours, Hotelplan, Alidays, Alpitour, Cividin, and Globe Travel) to Chicago to experience our city first-hand. The objective of this FAM was to promote the new direct flight from Chicago to Venice and educate the Italian Travel Trade on Chicago’s Tourism Product. Choose Chicago is working with Master Consulting and Visit USA Italy to conduct a follow up post-FAM, to ensure Chicago’s product coverage with the attending tour operators is carried out. Expanding on our efforts in Venice, Venice Airport sponsored and staffed a kiosk featuring Chicago for two weeks, to promote American Airlines new daily flight into O’Hare. Choose Chicago provided the graphic for a backdrop banner placed in the international terminal, as well as Italian language Chicago maps for distribution. Additionally, the team attended a Trade & Media event in Venice to promote the new American Airlines non-stop flight launch from Venice to Chicago. Choose Chicago was able to highlight Chicago through a destination presentation to 80 clients. The Global Development team also had a presence in Rome for an American Airlines Travel Event at Leonardo da Vinci Airport on June 12th. 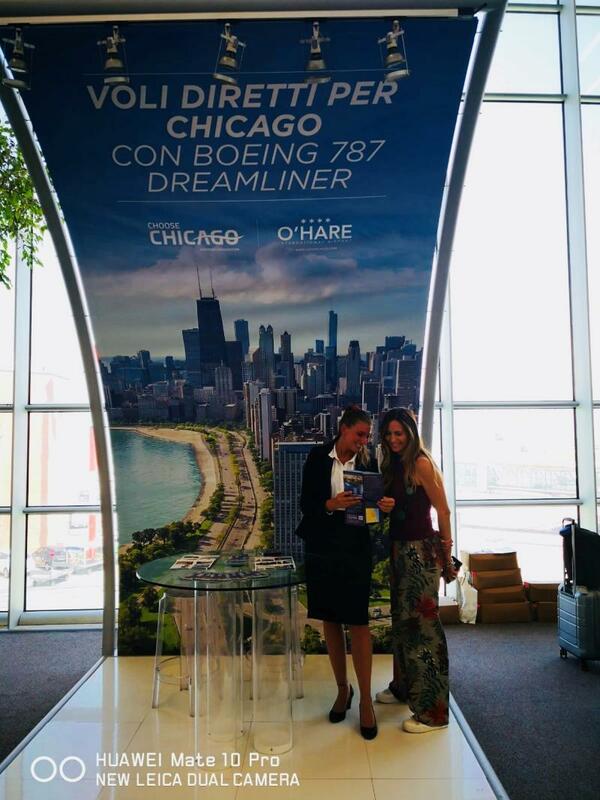 During this event, the team networked with 70 Italian Media & Travel Trade to educate them about Chicago’s direct flight service to Italy, and promote Chicago as a Tourism Destination. Japan: In collaboration with Illinois Office of Tourism, Choose Chicago hosted a Japanese Travel Trade FAM in Chicago. The agents were from Web Travel, Travel Gallery, Travel Factory, & Club Tourism. This FAM familiarized key Travel Trade professionals from Japan on Chicago as a tourist destination. Mexico: The Global Development team traveled to Mexico City, Guadalajara, & Monterrey for a Sales Mission in Mexico, to focus on the Mexican Travel Trade Market. We conducted in-house seminars with key clients to give an update on Chicago and enhance our partnership. We trained over 250 agents throughout this mission. United Arab Emirates: In collaboration with Aviareps Tourism, Choose Chicago hosted six webinars for Gulf Cooperation Council Countries. The purpose of this webinar was to train Product Managers and Travel Agents on the leisure products available in Chicago, and why Chicago should be carried as a leisure destination for their clients to book. An impressive 101 agents completed this training. USA: Attended James Beard Client event in New York City to thank eight top clients and provide them with an update on what’s new in Chicago. These clients are NYC based Receptive Operators & airlines. Choose Chicago’s Media Relations team hosted and/or supported more than 60 members of the media on individual media visits and group press tours to Chicago in June 2018. The team traveled to, hosted and/or were represented at six in-market media events (Toronto, New York, Paris, London, Venice) in June. Tennis fans, the Laver Cup will be here before you know it! For the first edition held outside of Europe, Team World is looking to use their home court advantage at the United Center. Just this past week it was announced Wimbledon runner-up Kevin Anderson, World No.8 John Isner and Argentine star Diego Schwartzman will join Aussie Nick Kyrgios and Juan Martin Del Potro on the Team World side. With one final captain’s pick left for Team World’s John McEnroe and four more sports to fill for Team Europe, keep an eye on @LaverCup to see who will be competing at the United Center. Laver Cup tickets are going fast, and limited single-session tickets are on sale today! Follow @lavercup on Twitter, Facebook and Instagram!